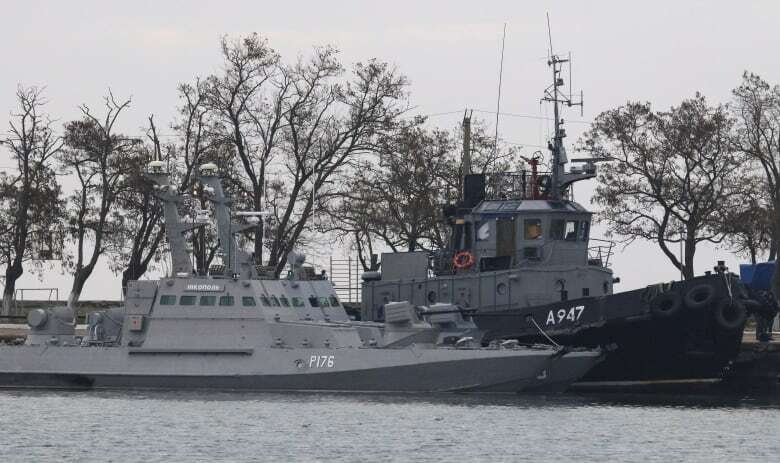 Canada joined its allies Monday in condemning Russia's seizure of three Ukrainian naval vessels near Crimea, but experts are divided on what the sharp escalation in the deadly and protracted conflict will mean. Canada joined its allies Monday in condemning Russia's seizure of three Ukrainian naval vessels near Crimea, but experts are divided on what the sharp escalation of the deadly and protracted conflict will mean. 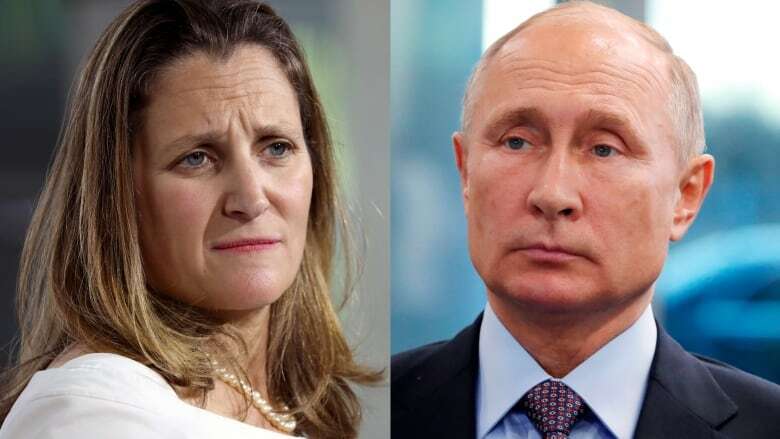 Foreign Affairs Minister Chrystia Freeland called on Moscow to immediately release Ukrainian sailors captured during the weekend skirmish and to ensure freedom of navigation through the Kerch Strait. The Ukrainian navy said in a statement that six of its sailors were wounded when the Russian coast guard opened fire on three Ukrainian ships in the Sea of Azov, which is located off Crimea, the peninsula annexed by President Vladimir Putin's government in 2014. Russia said three Ukrainian sailors were slightly injured during the incident and were given medical assistance. On her way into the House of Commons Monday, Freeland said she spoke with her counterpart, Pavlo Klimkin, in Ukraine over the weekend. Canada condemns Russian aggression towards <a href="https://twitter.com/hashtag/Ukraine?src=hash&amp;ref_src=twsrc%5Etfw">#Ukraine</a> in the <a href="https://twitter.com/hashtag/KerchStrait?src=hash&amp;ref_src=twsrc%5Etfw">#KerchStrait</a>. We call on <a href="https://twitter.com/hashtag/Russia?src=hash&amp;ref_src=twsrc%5Etfw">#Russia</a> to immediately de-escalate, release the captured vessels, and allow for freedom of passage. Canada is unwavering in its support for Ukraine’s sovereignty. NATO and G7 partners, including Britain, were among the other calls she made. "Canada will always be a steadfast partner of the people of Ukraine, and we will continue to work with our allies to hold Russia to account for its unacceptable behaviour," she said in a statement. Precisely what the Western allies, most notably the United States, are prepared to do is an open question. Washington sent mixed signals on Monday. Nikki Haley, the outgoing U.S. ambassador to the United Nations, was strong in her denunciation. "The United States would welcome normal relations with Russia, but outlaw actions like this one continue to make impossible," she said in a prepared statement. U.S. Secretary of State Mike Pompeo called on both sides to show restraint, but described Russia's actions as "a dangerous escalation and a violation of international law." But President Donald Trump refused to condemn Russia's actions and has not tweeted anything about the incident. Dominique Arel, an expert in Ukrainian studies at the University of Ottawa, said the chances of the West taking military action are slim, just the likelihood of further sanctions might be. It appears Russia is stepping up pressure on Ukraine by forcing a confrontation in the Kerch Strait after months of tensions and the buildup of forces. It is likely an attempt to put a stranglehold around the important steel exporting city of Mariupol, which despite the war in eastern Ukraine and its proximity to Crimea, has continued to thrive and contribute to the country's economy, Arel said. "Russia always takes us by surprise," he said. "It's a live war. A war of attrition where they are trying to make Ukraine pay at many levels, including economically." 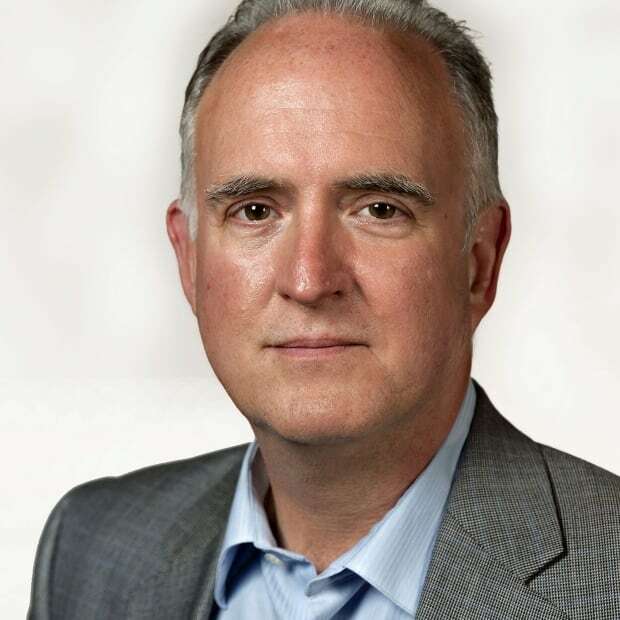 David Carment, another expert at Carleton University and the Canadian Global Affairs Institute, said the escalation is not entirely surprising in light of the upcoming G20 Summit this weekend in Argentina. Andriy Shevchenko, Ukraine's ambassador to Canada, said Monday the Russians had prepared for the escalation for months and now feel comfortable blockading the Kerch Strait in defiance of international condemnation. "They want to cut off our seaports on the Azov Sea and it's extremely important for the exports of Ukrainian steel and commercial products," said Shevchenko. "I think we should also consider the message itself to Ukraine and free world itself. Russia is saying it will do whatever it chooses." Canada has 200 soldiers stationed in western Ukraine on a training mission. For them, it's business as usual, National Defence said on Monday. "We currently have no indication that events in the Sea of Azov might affect the mission or the security of CAF personnel," the department said in a statement. "We will continue actively monitoring the situation." Officials would not say if there was heightened security in light of the fact many of Ukraine's eastern provinces have been put under martial law and on war footing with fears of a direct invasion. The army also has over 450 soldiers stationed in Latvia as part of a NATO mission to deter potential Russian aggression. "Due to operational security reasons, information about force posture and protection measures cannot be released," the department said about the Baltic deployment.